Japanese composer Miho Hazama offers us a delightful collection of pieces on her latest album, Dancer in Nowhere. Played by the versatile and labile M Unit collective, here seventeen strong, the big band feeling is unmistakable. Miho’s compositions are modern and fresh, offering many a pleasant surprise, some of which can be heard in the preview track, “Today, Not Today”. In short, if you like what you hear, there is much, much more lying beyond the preview. Akur is the latest release of newly founded label Insitu Recordings, which focuses on Gamelan music and music from Indonesia. This album is a collaborative effort between Indonesian artist Fahmi Mursyid and Japanese artist Yuko Araki. The result is an avant-garde and utterly contemporary take on traditional Gamelan music, altered with electronic effects. The result is beautiful and transcendental, going through and beyond terms like “classical” or “electro” or “world music”, and coalescing into something truly unique. 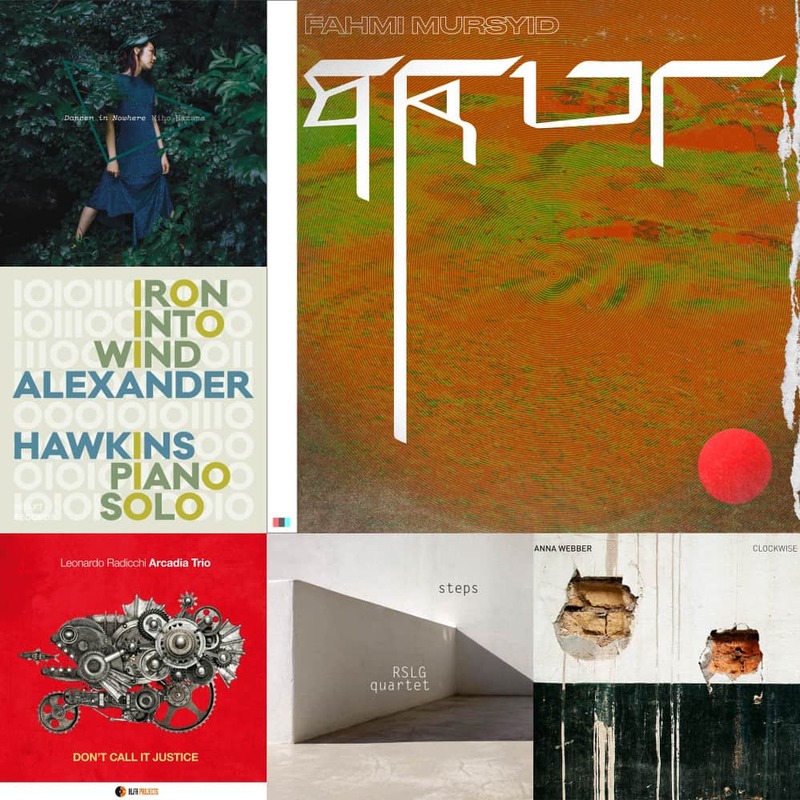 Iron into Wind is a solo piano effort by London musician Alexander Hawkins. Showcasing Alexander’s maturity and breadth as a composer and performer, the album goes into wildly diverse territories; from the contemplative, to the harsh, to the chaotic, and the oddly ordered. Here, we are offered only two preview tracks, which don’t cover the vast range of feelings heard across the album, but they give you a glimpse of what’s to come. Leonardo Radicchi’s Arcadia Trio is a newly formed politically inclined jazz group. Leonardo is no newcomer to activist music and actions, but Don’t Call It Justice is the latest output of the Berklee graduate. Each composition is the reflection of a theme or experience, marvellously written and masterfully performed by a host of musicians enhancing the trio formula during crucial moments. Don’t Call It Justice is an astonishing effort. RSLG is a Greek avant-garde jazz quartet, purveyor of high-quality sonic explorations. Thanks to structured improvisations and their penchant for contemporary classical music and noise, Steps is a modern masterpiece. The four musicians blend in naturally with each other, and offer us a satisfying glimpse into the chemistry between improvisers. Anna Webber is a New York-based woodwind player and composer. Clockwise is her latest effort, offering us an interesting, thought-provoking séance. With many rhythmic changes, contrapuntal interchanges, and a modern sense of harmony and melody, Anna Webber has crafted here a fantastic album—her sixth one—performed by a proficient septet in which she also takes part. The album is really brilliant, a must! On	February 28 2019, this entry was posted.